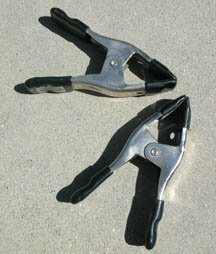 Woodworking clamps squeeze and hold. How hard can that be? Not so hard, actually. And a couple of good ones will help you along in too many ways to mention. Buy them in pairs. West Hills Wood has a few different grippers in the shop. The two that find the most use are the quick release and basic spring types. 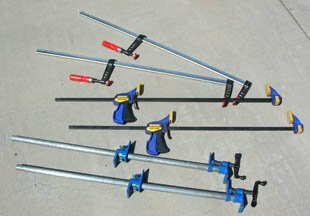 Quick release woodworking clamps come in a variety of lengths, styles, and manufacturers, but all operate essentially the same. A static head piece resides at one end of a metal bar while a movable squeeze trigger handle is at the other. 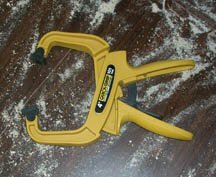 The squeeze handle allows you to use your full hand strength to increase pressure. A tension release trigger does just that - releases the tension with one touch. One handed operation makes these a great time saver. 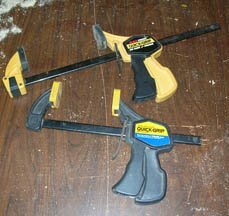 Our pair of 12-inch quick releasers get regular use, often to hold a piece down for cutting, routing, or sanding. We also use them in 6- and 24-inch flavors. Simple spring-loaded devices find use as holders for stop blocks and anything else that needs a quick hold. We keep one the tool belt, next to the tape measure. More is better. There are times we look at our collection and wonder how and why we got so many. Then a project comes along where we’re making a couple of bookcases and suddenly they are all in use. It takes up a lot of space, but saves us time by having all the pieces done at the same time. Remember to always dry assemble your work before adding glue. Then apply good enough pressure to tighten the joint evenly but don’t squeeze so tight as to ooze all the glue out. Reduce the chances of marring the wood by using scrap wood against the project wood. Not all designs work as well as the rest. The yellow plastic ones shown at left came free as a promotional item and while we’ve tried to use them many times over the years, they have proven to be good at absolutely nothing. Well worth their price.